The key Shanghai Composite Index sank another 7.63 percent Tuesday, extending its worst four-day rout since 1996. The index has fallen 22 percent since August 19. 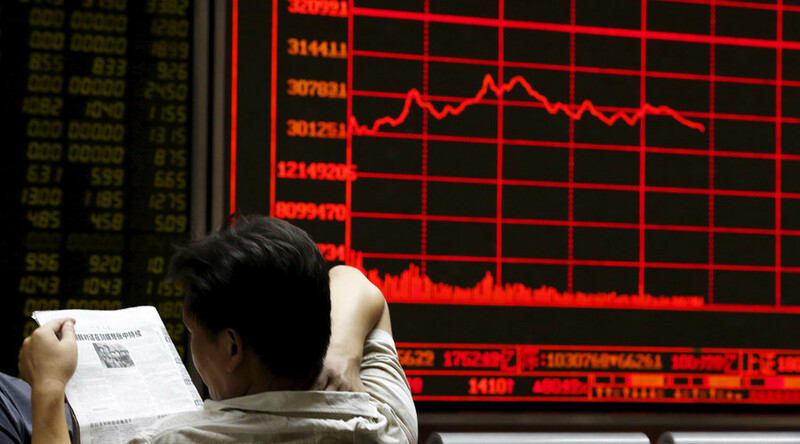 Investors were rattled as the China Securities Regulatory Commission made no attempt to reassure markets after Monday’s crash, as they did a month ago after an 8.5 percent drop. Tokyo’s Nikkei index was again dragged down by Beijing, closing four percent down. Other Asian markets managed to recover after Monday's collapse. Hong Kong's Hang Seng closed under one percent higher, while one of the previous worst-performing markets, Taiwan’s TSEC 50 Index, closed 3.58 percent up. European markets on Tuesday were making a modest recovery after the Black Monday crash. London’s FTSE 100, Germany’s DAX and French CAC 40 were growing by between two to three percent in afternoon trading. In fact, all European equity markets were trading in the green as of 09:00 GMT. In the past, China’s central bank has regularly intervened in an effort to revive markets. The People’s Bank of China has spent more than $200 billion buying Chinese stocks since early July. In August, it prohibited traders from borrowing and repaying stocks on the same day, making it difficult to benefit from hourly price fluctuations in the stumbling market. The state-run China Securities Regulatory Commission (CSRC) announced in July that any shareholder with more than a 5 percent stake in any Shanghai- or Shenzhen-listed company, including foreign investors, should not reduce its holdings over the next six months.